When our business processes work as designed, and when our products meet or exceed customer expectation, we may describe the results as "perfect". But if we are honest with ourselves, everything in business is simply a striving for perfection. There are too many constraints, limits and tradeoffs in any process or product to create a "perfect" solution, yet that doesn't stop many from trying. We even have a saying attributed to Voltaire to reflect this thinking: don't let the perfect become the enemy of the good. Yet executives and cultures set high expectations of execution and result, expecting if not perfection, then something awfully close. After all, true Six Sigma is 3.4 errors in 1 million products or operations. This is a standard difficult to achieve and difficult to sustain, in processes and products that are well-understood, in which the firm is deeply experienced. So what does this striving for perfection do to innovation? Innovation is frequently the opposite of perfection. If we are honest, innovation is risky, variable, full of errors and "failures" that may ultimately lead to new successes. Innovation fails the first definition of perfect, because innovation will frequently create errors or defects. If you have a flawless innovation process, then your focus is too incremental, too same, too constrained. As they say about skiing, if you aren't falling occasionally, you aren't trying hard enough. Innovation clearly fails the third definition as well, in that most organizations don't have a "standard" for innovation processes or outcomes. Without a standard, how can innovation be measured? How can we claim success? Not only is innovation an imperfect science, it is more effective and returns greater value in its imperfection. Exploration, experimentation, cross-fertilization, learning from mistakes and incorporating new learning is critical to innovation success, and seems far less than perfect to an organization trained in Six Sigma near perfection. Perfection is about constantly honing deep and well-practiced skills. Innovation is usually about discovering new tools, new methods and unexpected or unarticulated needs. There's little perfection in innovation, other than the realization that innovation is messy, imperfect but vital for growth and differentiation. Here resides the ultimate conundrum: in organizations that strive for flawless execution, that hope for perfection in processes and products, that measure failure and error several decimal places to the right of the dot, what place does an intentionally imperfect, highly variable, messy and uncertain process take? Don't the anti-bodies of the "perfect" organization work to reject the imperfect processes, or worse, attach themselves to the imperfect work and seek to adjust their operations to become more like the perfect operations and outcomes? On the whole, you'll be better off if the anti-bodies actively reject innovation and its messy, imperfect ways, because that rejection will be obvious. When the perfect anti-bodies co-opt the innovation activities, that's when the real trouble starts, because what appears to be innovation simply becomes a perfected, rigid process structured to deliver near perfect results, which may please internal processes and expectations but will fail to deliver value. While internal metrics and measures value perfection, customers, consumers and channels value solutions that address unmet needs. Those solutions require new discovery, changes to processes, trial and error, learning from mistakes. Truly new products and services don't emerge from perfect processes, but from discovery, experimentation, failure and new insights. We innovators need to help organizations embrace imperfect innovation processes which will yield better, more interesting ideas, and help executives balance two almost mutually exclusive concepts - the near perfect day to day operations, flawless and held to a high standard, and the necessarily imperfect innovation operations, filled with variability, risk and uncertainty, but vital for growth and differentiation. I'm surprised at how often I'm surprised by my news aggregator. Reading about innovation is always surprising, for two polar opposite reasons. First, I'm constantly surprised by how creative and interesting people can be when they are allowed to dream up new ideas. Second, I'm constantly surprised by how often teams crash and burn when attempting innovation, and we are left reading about the failures. There's a huge gap between expectation and reality, between plans and optimism at the start and the breadth of outcomes at the end. Of course, screaming headlines gain more readership - in TV news, if it bleeds, it leads. Where innovation is concerned, what fails goes first. No, we typically read about the failure of brainstorming or other idea generation tools. Strange that so often the articles we read about idea generation don't seem to quote IDEO or Doblin or even humble OVO Innovation. We've been very successful with brainstorming and idea generation. But where innovation is concerned, failure is trumpeted and success diminished in the media. When companies fail to innovate, they tend to round up the usual suspects. Innovation is too hard, or the tools weren't quite right. They approach innovation like Goldilocks and end up sounding a bit like Goldilocks in the end. What's almost universally true is that the biggest barrier to innovation in any organization, in any geographic region, in any industry, is internal corporate culture. Want more innovation? Change the culture to emphasize innovation. Now here's a case where the Goldilocks syndrome is accurate. Most innovation teams never get the resources, time or funding they need in order to succeed. The first time I hear about an innovation team getting the resources, time and funding they actually need to do the work they've been asked to do will be the first time. Why claim that innovation is important if you won't staff it or fund it appropriately? Small companies play offense, because they want to gain market share. Large companies play defense to defend market position and share. In every industry, new entrants are trying to devise ways to disrupt the market and take share, while large firms tinker at the edges or talk about disrupting another market. We know that disruption will occur in every market - why not disrupt yourself, rather than react to another entrant or competitor? The disruptor has the advantage of knowing when and how the disruption will occur. Why is so much of the news about innovation negative? Why do so many people declare the "end" of innovation, the "failure" of brainstorming? Why does the media seem to suggest that innovation is so difficult that only special firms like Apple, 3M and P&G can do it? Innovation does require determination and commitment. It does require working to discover new needs and creating change in a safe, comfortable environment. But those facts don't mean that innovation is difficult. It's the commitment that is difficult - committing to change, risk and uncertainty for future growth rather than sticking to the knitting and cranking out consistent short term profits. When we read about how difficult innovation is, or how unreliable the tools are, we reassure ourselves of our decisions to simply tinker around the edges rather than commit to the work necessary to transform an organization into a committed innovator. This safe, comfortable nest you've built for yourself is built on false assumptions. The time is coming quickly when being a good innovator will be the "safe" option, when the pace of change, heightened level of competition and increased consumer demand will require that a firm sustain innovation merely to be considered a viable player. Stop reading the headlines and go ask an expert - is innovation really that difficult? Are the tools really that unpredictable? Can my organization get a lot better, in a short period of time? Is the investment worth the risk? You can contact me to have that discussion, or any experienced innovator can answer this for you. Don't believe the negative news. Start doing what you know you need to do, and don't let headlines distract or dissuade you from making your organization far more effective as an innovator. There's a common fallacy in the military to learn too well the lessons of the last war, and to spend far too much time preparing to fight the same war all over again. The lessons of the Cold War prepared our military to fight static land battles against easily identifiable enemies, but left us ill-prepared to fight insurgencies in urban areas. The military isn't the only organization that struggles with "last war" thinking. Too often innovators are captivated by the compelling features of current products, or anticipate that future needs and demands will mirror existing or past needs and requirements. In many industries we work in, the average product development cycle time is between two and three years. That means that a perfectly valuable and interesting idea today won't be launched in the market for several years. The question we need to ask is: will the markets be the same in several years as they are today? Will customer needs and demands remain the same, or change? Will other competitors or substitute offerings enter the market during that time? Too often we build products and services to meet the needs we see today and fail to anticipate emerging needs, threats and opportunities in the future. As an illustrative example, consider the concept of US oil consumption. Just three years ago, in 2010, most industry experts were certain that the US would remain dependent on imported oil for years to come. However, due to advances in extracting oil from oil sands and shale deposits, experts now believe we may become virtually energy independent in a few years. Imagine the businesses that planned on the need for continuous oil importation. Would their plans, products and services look different today if they had anticipated an on-shore oil boom? What products, services or investments would they have made three to five years ago if they had been able to assess the trends in fracking and anticipate more on shore oil production? We recommend pursuing future insight in any innovation activity that is has either a very long development cycle or is intended to result in a disruptive product or service, or both. Gaining future insight is actually fairly simple, and part of our regular innovation program. You gain insights about the future by gathering trends from your environment. What's true about trends is that everyone is aware of some trends - technological, economic, or societal - but teams rarely gather to assimilate trends from different perspectives and try to ascertain what the impact to markets or products will be if the trends are amplified over time. We tend to use the PEST categorization - Political, Economic, Societal and Technological - to ensure we are balancing trend inputs from a number of sources, rather than looking only at technological or societal trends alone. Trends are simply significant shifts in one or more of these categories over time. For example, we can say that Europe is getting progressively older (the indigenous population is aging and fewer babies are being born) while becoming more ethnically diverse as immigration continues. Further, we can assert that economically Europe will remain in crisis until the Euro and banking issues are sorted out, and due to increased immigration and issues with the common currency there are likely to be shifts to conservative or nationalist parties in Europe, with the accompanying changes in budgets and policies. Once we've identified key trends - again, significant changes occurring over time that will impact your market - we start building scenarios about a near term future. Basically, a scenario is developed by projecting trends into the future, and understanding what that future may look like if the trends are emphasized and amplified. Using my Europe example above, I might anticipate that in five to ten years time the European Union has two currencies, the Neuro (Northern European) for Germany, Netherlands and other fiscally conservative countries and the Seuro (Southern Europe) for Greece, Italy, Spain and other countries that seek a devaluation. We'd need to paint a picture about what that means, along with societal trends (aging population, immigration) and technological trends. We'd place ourselves in that future and tell stories about that future. What are the emerging customer segments? What are the emerging needs? Which competitors or substitutes emerge and threaten our position in the market? Once we understand the story and the emerging needs, threats and customers, we can investigate implications. What products or services should we start working on NOW to anticipate future opportunities? What threats will emerge that will disrupt existing products or channels that we can take action on now? What new customers or customer needs will emerge that we should start designing for and generating ideas for now? These are the implication that matter as you start an innovation activity, hoping to build interesting and relevant products not simply for today's customers and needs, but for future customers and needs as well. This activity, often overlooked, is perhaps the easiest and most powerful activity you can do to start an innovation activity and ensure broader and more thoughtful perspectives. The work is fairly simple to do with the right facilitation, and it generates a lot of new insight and avenues to pursue. Additionally, it informs the team and helps structure your customer research. Doing innovation work without gathering trends and developing scenarios is like driving at night without your headlights - you simply can't anticipate all of the potential problems ahead. You need to do more than simply prepare to fight the last war. Real innovators are uncovering emerging needs and customer segments before their competitors do, and are doing so early enough to be able to present solutions to those needs as they arise. Given the pace of change and increasing customer demand, you need to constantly assess trends to understand what is likely to change, and how fast the change will occur, to remain relevant to your customers and your potential customers. There's nothing like an old saying to illuminate a problem or opportunity. When I say that someone has "painted themselves into a corner" I am referring, of course, to the instance when someone paints a floor and leaves themselves no pathway to a door. 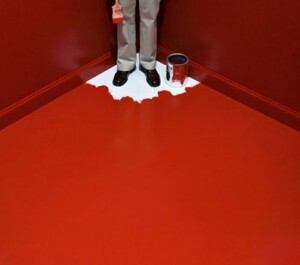 The painter covers the floor with wet paint, only to discover he or she left themselves no simple pathway to exit the room. He or she must wait for the paint to dry before leaving, or walk through wet paint. Of course we use this analogy in different settings today to describe situations where an individual has maneuvered themselves into a place with no viable alternatives or exits. All too frequently this analogy applies to innovators. Let me explain why that is, and why innovation often seems so incremental. In most innovation activities, early at the start of the project or initiative there is a lot of enthusiasm and excitement. The team will finally have a chance to tackle an interesting challenge or problem and recommend new solutions that may become valuable new products and services. But what often goes missing in the early stages is an explicit statement of scope, which defines anticipated outcomes and expectations. Unless everyone agrees that the outcome should be radically different or disruptive, the team will take the assumption that existing products, services and business models are static and must be protected, therefore any new idea must peacefully co-exist with existing products and services. And this is a point where the team eliminates alternatives and starts painting itself into a corner. Without explicit agreement about the expected outcomes and scope of the activity, the team will constrain itself. Often, even with an explicit statement about scope and expected outcomes, teams won't allow themselves to think more broadly or disruptively. Here I'll borrow a phrase from a previous president - teams work under the bigotry of low expectations, and they limit themselves to the first Hippocratic oath: first do no harm. Their expectation is to do no harm to existing products, or services, or business models, or channels. This is why so many innovation activities result in ho-hum incremental products or services rather than interesting disruption. Teams instinctively select an evolutionary model of innovation rather than a disruptive model of innovation, and who can blame them. Again, without explicit and constantly reinforced messages of expected outcomes and innovation scope, every team will fall back to safe assumptions. Once the evolutionary model is selected, options narrow quickly and disruptive or radical ideas are quickly tossed aside. As evolutionary models of innovation are selected, the existing frameworks, evaluations and assessments are used. As these continue to narrow scope and constrain ideas and thinking, the range of possible outcomes narrows even further, to the point where innovation becomes about moving a knob or changing colors of existing products. In other words, very incremental. This is when the crowds emerge with the pitchforks to declare the "failure" of innovation and the uselessness of innovation methods, practices and tools. While their own culture and perspectives have limited their risk taking and failure, it's far easier to blame innovation for false promises of disruptive ideas, when, unless it was an explicitly expected goal and outcome, was never going to happen in an evolutionary model of innovation. It should be obvious, but it often isn't, that the initial scope, goals, perspectives and mindsets of the team and how they think about their jobs and potential outcomes for innovation matter far more than the tools that they use. And so many people have been so indoctrinated to small change, incremental improvement, continuous efficiency and the elimination of risk and uncertainty that getting past that mental framework is exceptionally difficult. Galileo, for all his faults, was convinced that science and his discoveries of the motion of planets was more scientifically correct than the existing doctrine of the church. Columbus was convinced that he could sail west to arrive in the east, and had the daring to try to prove it. The reason these individuals remain famous today is that their examples are so rare - willing to reject existing doctrine and thinking to envision a radically different alternative. That's what it takes to generate radically different ideas. Rather than ask: what can we invent that sustains the existing markets and models we should ask: what can we imagine that dramatically shifts the balance of power in a market. That shift can come from new products, new services, new business models or combinations of these and other factors. But we'll continue to paint our teams into corners with few alternatives that result in barely differentiable innovations until we set out intentionally and consistently to define disruptive innovation outcomes within the scope of the project as we start, and reinforcing those goals during the project as we progress. If you want incremental innovation, if spending a significant amount of time and effort to achieve small improvements is OK with you, keep doing what you are doing. If you really desire dramatic innovation outcomes, disruptive new products, then stake out that vision early, ensure everyone on the team understands the vision and doesn't limit their thinking, and reinforce that vision and expected outcomes constantly during an innovation exercise. Don't allow your innovation teams to paint themselves into corners that weren't intentional. 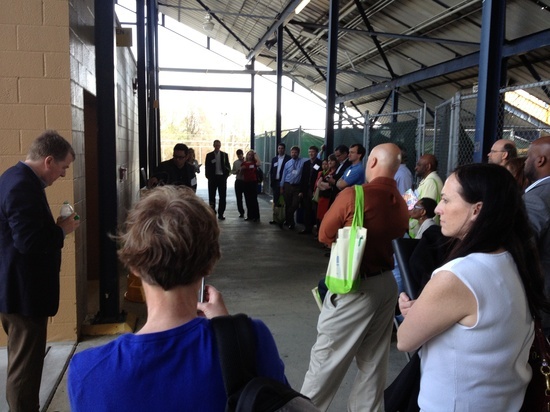 We had an interesting and exciting day last Friday, April 12, in Greensboro. Innovate Carolina is normally a conference to discover what other innovators have done. It became, in fact, an example of what true innovators can do. During the initial keynote speech by Chris Trimble, a campus police officer entered the building and requested that we all exit immediately. The police had been notified that a man had been seen on campus with a gun. We were quickly shuttled to another building, and then onward to wait out the investigation under the stands of the football stadium. While I am happy to report the report of a man with a gun was eventually found to be false, especially in the light of a school shooting in Virginia and the Boston Marathon bombs, we found a way to be innovative while waiting for a resolution. Here's Jeff Grant presenting to a "breakout" under the stands. Hats off to Jeff, to Scott Edgett and to the guys from Edison Nation Medical for their impromptu presentations in trying circumstances. Once the all clear sounded we were able to move back into the auditorium and fortunately, everyone was able to speak, although we did have to shorten many of the presentations. The folks at NC A&T, who were our hosts, were gracious and exceptionally helpful. These folks deserve your time and attention for the excellent work they did at our conference. While we will remember this conference as the one that was interrupted, the speakers and the messages were exceptional. We look forward to next year! The initial title I gave to this blog post was "innovation is more like farming than magic" but I felt that title was a disservice to both farmers and magicians. However, it often seems like many of my clients want innovation to be more magic than work. They desire an instantaneous result sprung from an empty hat with little work or commitment. Innovation isn't a sleight of hand, but a consistent commitment to methods, tools and disciplines. What they don't understand is how closely innovation, especially innovation success sustained over a long period of time, resembles farming. I was lucky enough to grow up in a farming family. My mother's family has been in the business for literally centuries. Living on a farm and raising the food that you eat gives a different perspective on where things come from, and what it takes to succeed. Farmers today are far different than the image you may hold of them. While they work close to the land, many are very technically sophisticated, linked into commodity exchanges, leveraged financially and using the latest in agroscience, satellite imagery and farm equipment. Yet in many ways they are still beholden to inputs and environmental conditions outside their control. If this sounds a bit like your business environment, you may be surprised how many similarities there are between good farming practices and innovation. What do farmers do all day? Yet, in spite of high technology, advanced weather prediction systems, the latest in fertilizer technology and much more, a farmer can do everything right and still lose a crop, due to a freak snowstorm, a periodic blight, an unexpected drought, or the overabundance of yield from other farmers which drives down the price. How do those steps relate to successful innovation in a large business? Prepare the ground, by developing good communication about the need for innovation and align corporate cultures so that the culture embraces innovation rather than rejecting it. Harvests the best ideas when the ideas are ready, not when the demand is the highest. Good innovators demonstrate patience. Yet, in spite of all their best intents, good innovators often find that even though they did everything right - improving the culture, planting lots of ideas, encouraging nascent and disruptive concepts, remaining patient - everything can, and sometimes will go bad. Timing, market conditions, technology shifts and other internal and external conditions can stymie innovation. When the farmer's crop fails or doesn't yield, he or she simply responds by doing what they know best - repeating the process and hoping to do an even better job next year. They sustain their practices. When corporations aren't initially successful with innovation, they blame the tools, the market, the competition, and take up another management philosophy or technique rather than learning from errors and mistakes to improve innovation outcomes. Too many firms believe innovation should be like pulling a rabbit out of the hat - a fast result with little investment. There's no real rationale for this thinking, but it seems awfully prevalent. What they fail to understand is what the farmer knows - innovation, like growing crops, follow a natural process and has a progression that demands early investment, developing the environment, using the best tools available. And even when you do all that, it can still fail. The real signifying action is what your organization does when it inevitably "fails" at innovation - which it will. Does it cast innovation aside, or does it recommit to all the necessary activities to build a sustainable innovation capability? And, while farming may seem a far cry from today's rough and tumble, ever-accelerating business environment, remember that the farmer deals with all the same financial issues as a business, manages a large capital investment, manages people and technology, and is more dependent on external and environmental factors outside his or her control than any other business. Which leads me to one other factor that farmers have that innovators need to mirror. No one farms who doesn't love to farm, and no firm innovates that doesn't love to innovate. Today I'd like to use two parables to describe why so many firms fail to identify interesting innovation opportunities. Six learned blind men live in a village. One day an elephant comes to the village, and no one is quite sure what to make of the elephant. The blind men, who are wise, are brought to the elephant to describe its character and makeup. Each of the blind men touches the elephant and describes the elephant from his perspective. One touches the elephant and describes the elephant from that perspective. Another touches the elephant on the trunk, another on the leg and so forth. All of them are partially correct, but none manage to piece their perspectives together to see the whole elephant. To truly discover customer needs, we need to define the width and breadth of potential customers (both those who currently buy from us, those who currently don't buy from us and the potential future customers) and their current and future needs and expectations. Only then are we prepared to discuss what customers will want in the future. This means a divergent-convergent approach to customer needs is necessary, first enlarging the scope, discovering all the potential customers as possible, then drilling in deeply with those actual and potential customers to uncover and understand current needs and unmet or undiscovered needs. There's another saying that is also valuable here. That one is also familiar - can't see the forest for the trees. In context here, it means we've looked at the elephant so long that we've lost sight of the elephant. Again, human nature is to divide and conquer, to break up larger problems into smaller problems because they are easier to think about and manage. We'd prefer to think about an elephant as the sum of a tusk, a tail, a leg, an ear and so forth, but the elephant is larger and more complex than that. While we are simplifying the elephant, we are missing the opportunities that exist in the complexity. True innovation is based on both small continuous changes to known challenges or problems AND rapid disruptive change to unmet needs or undiscovered opportunities. The reason innovation often looks so small and insignificant is because we forget the second portion - rapid disruptive change. That requires asking what if the elephant didn't exist at all, or what might replace the elephant in a different setting or situation. Many clients struggle with big, disruptive innovation because their corporate culture and their personal training and bias emphasizes small, quick changes focused on discrete, incremental challenges or problems over larger, disruptive change that may require rethinking the status quo or changing the business model or operating paradigm. When the focus is too small and too narrow - the trees over the forest - innovation results seem small and insignificant. It's only when you can see the forest, and imagine how to replace the forest, or find a different forest all together - that disruptive innovation will occur. This is what your nimble competitors are doing - imagining a world without the forest, rather than trying to spruce up the forest. What's this got to do with innovation? Gaining insight into customer needs is paramount if you want to innovate. Most of our clients understand this. What they fail to understand is that existing market research or market insight is often short-sighted, biased and backward looking. They recruit internal experts who describe customers in the same way that the blind men described the elephant. What is needed is to go into the field with the perspective of a beginner's mind and confront the "elephant" - your customers and prospects - with a new perspective and greater empathy. Learn to both engage the customer and enlarge the problem set. Until you can do those two things, your customer insights, ethnography, market research or whatever you want to call it will simply reinforce what you are already doing, rather than introduce you to new innovation opportunities.